One Perfect Rose is a single signature book. 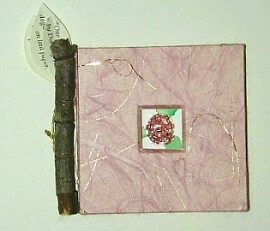 The cover consists of matboard covered with a pale pink unryu. The cutout on the front was done with a matcutter. Inside text, by Dorothy Parker, was written in gouache with a steel pen on laid paper. The rose is a cluster of pink glass beads, shaped with gold beading wire. The signature was sewn with beading wire, and attached on the spine to a piece of dogwood branch. The leaves contain a brief colophon, and were also attached to the twig with beading wire. 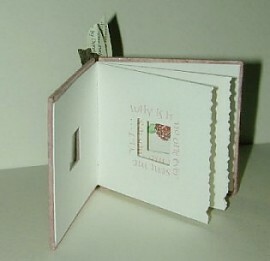 The dimensions of the book are 2½" x 2½".